76 : Statue of a Sphinx. Parian marble. 778 : Euempolos, Grave stele. Pentelic marble . Found in the Piraeus. 880 : Handshake. Grave stele. Pentelic marble. Found in the Piraeus. 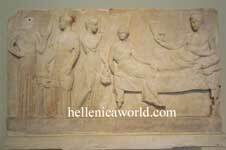 1500 : Dionysos, Votive relief. Marble Found in the Piraeus.